We've been working like fiends, but at least we're finally showing some progress after four long days. Chip, our crew mate, will arrive on Saturday and we are hoping that we'll have his berth clear for him, rather than its being a garage as it's been for years. 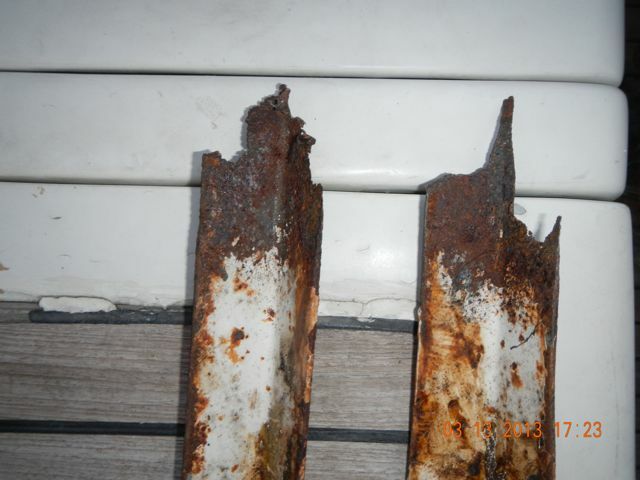 These are the rusted ends of the old rudder cage. They don't have much strength! 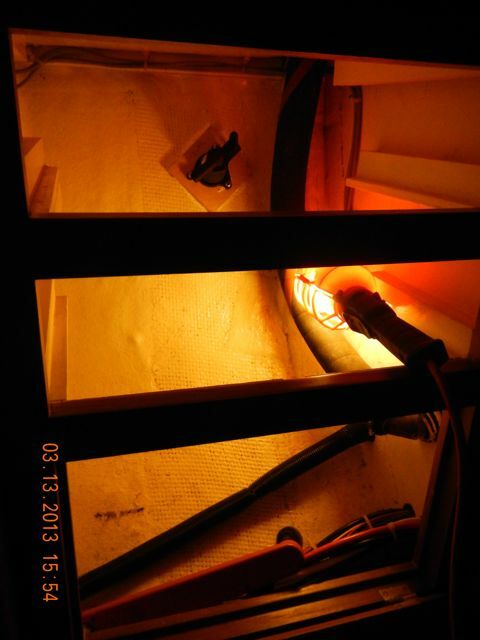 The rudder cage keeps the rudder stable and vertical, so it was crucial that this be repaired. Sergio welding a leg in place. Our new rudder cage! 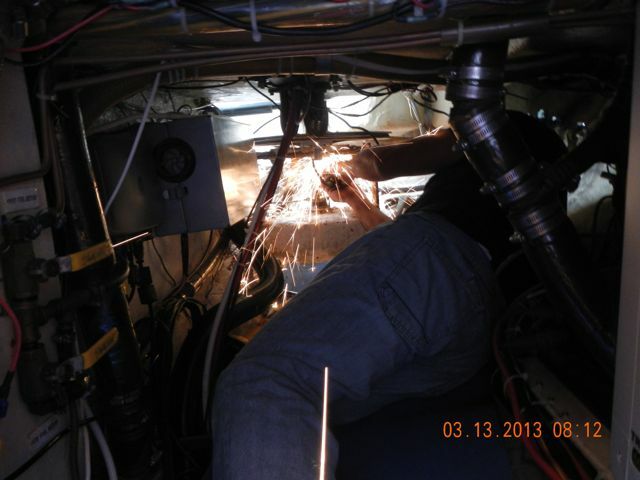 He bolted the stainless steel plates to the hull and welded the legs "in situ". Nice work and very strong. No more rust! Our new through-hull from the inside. 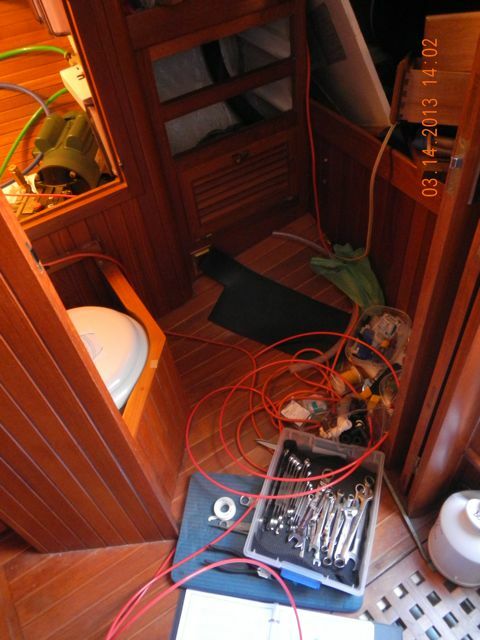 What you see here is the seacock (and "backer-block"), a hand-operated valve to close the through-hull when needed. The diagonal (upper right to lower left) black tube actually hides the hoses from the reverse osmosis vessel. We keep winch handles in this space so we had to protect the high pressure hoses. Drawers fill the upper two rectangular holes. Our through-hull mushroom from outside. The tiny blue fleck is a piece of marker tape to orient the mushroom while we caulked it into place. 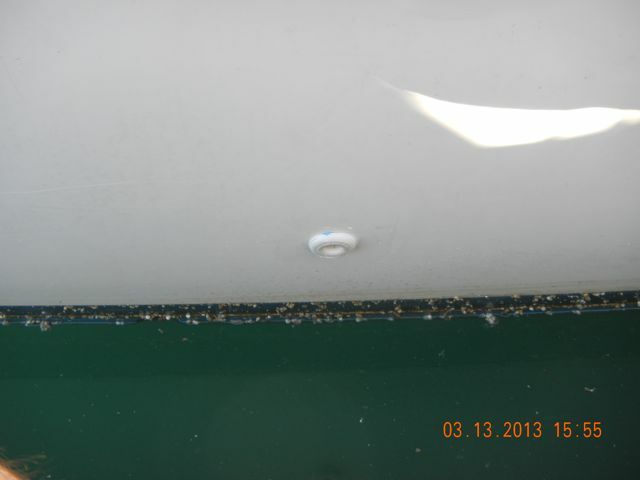 I mentioned in the blog how much we HATE drilling 7/8" holes in the hull, this close to the waterline. 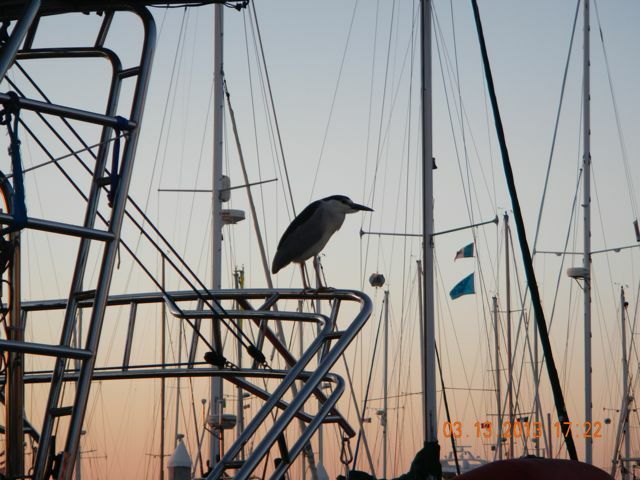 A blue heron watches sunset as we work in the cockpit. Bird knows more about enjoying life that do we. 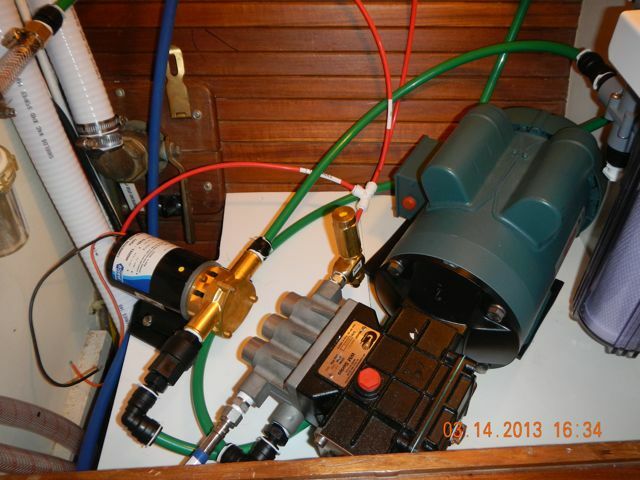 How to join our water system to the desalinator's system. The fitting at left screws into our new through-hull. Its hose barb is how all of our hoses fit together. 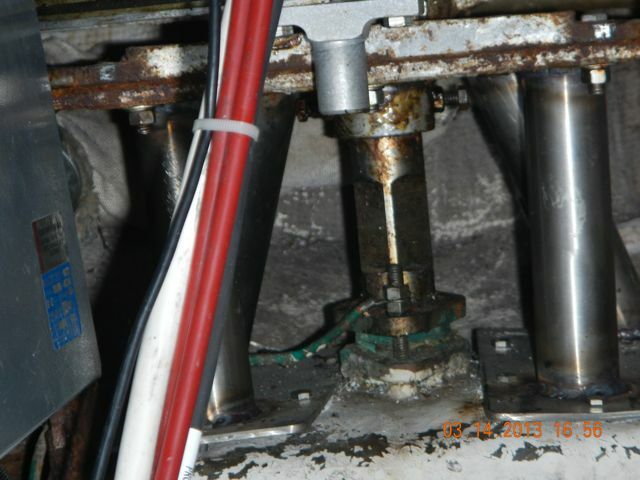 The tiny white fitting at right connects to the desalinator hoses. The pieces in between adapt one system to another. It works well but is complicated. If we had not brought down EVERY part, we would not have been able to complete the project. This is the reclaimed space in which we're placing the desalinator. When we bought Wings, there was a Type 1 MSD/marine sanitation device: an on-board septic tank. Type 1 means that the effluent was sterilized to some standard. Ours used formaldehyde as a sterilizer and it did its job well. Formaldehyde has the double and dubious claim to be both very stable and very toxic. When the benefits of sterile effluent were outweighed by the toxicity, they banned the system. We removed it and it went into the trash. 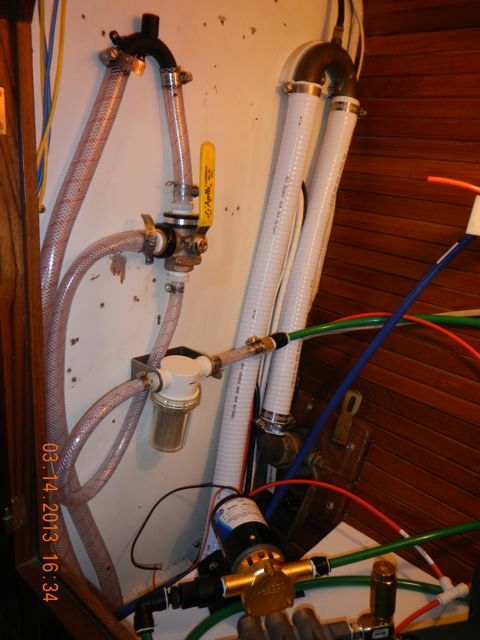 You're looking at the white hose of the toilet (which now goes directly overboard), the small filters and valves of the desalinator, and the color-coded hoses. The boost pump is on the shelf at left and the 44-pound electric motor and high pressure pump is at right. Bill's playpen for these many days. Jeez, I don't understand why Conni is so crabby! 8 AM, I crawl in, 6 PM I crawl out, four days and counting. 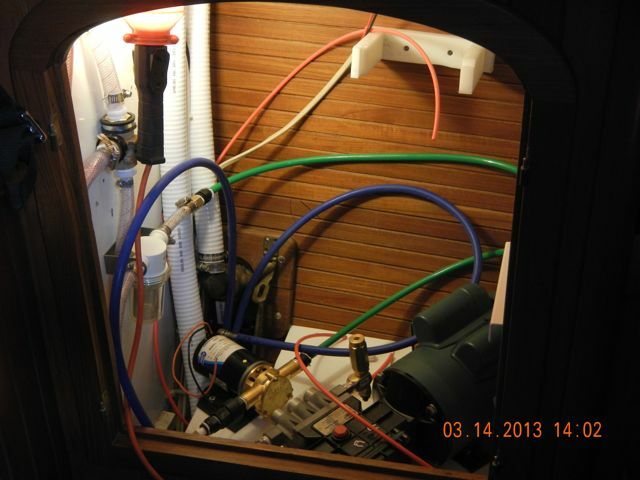 There is a through-hull for the toilet and I tap off of that for water to the desalinator. The yellow-handled valve at upper left sends water to the toilet or the desalinator. 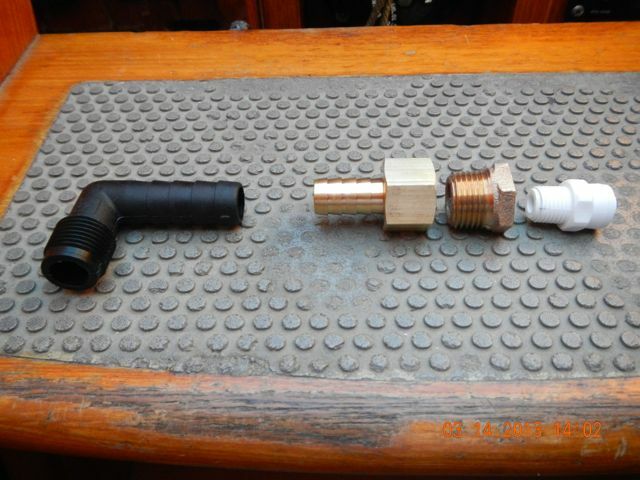 The tiny strainer is the first of many filters for the desalinator. The desalinator removes salt and minerals but it does not like particulates. They're removed in a sequence of filters. It's easy to see the layout of things. 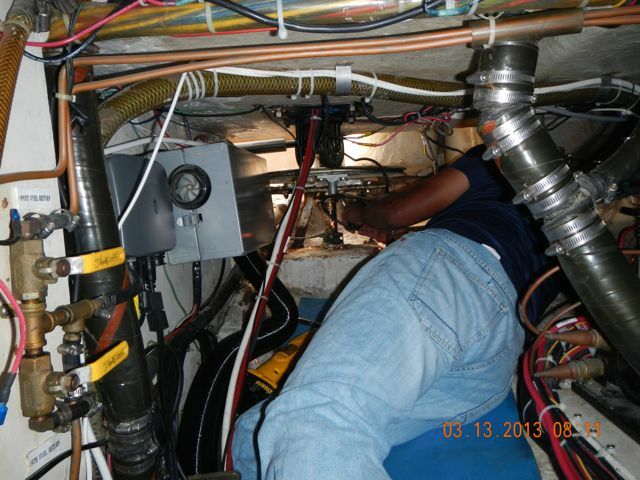 Red hose carries brine to the through-hull that we installed. Green hose is 1/2-inch hose for input seawater into the system. You can see the huge electric motor and the large pump at right. This motor is 120 VAC, so the device must be operated when our Honda generator is running. We can charge batteries, charge laptops and iPads, and make water. It will be a very cool system....when I get it running! 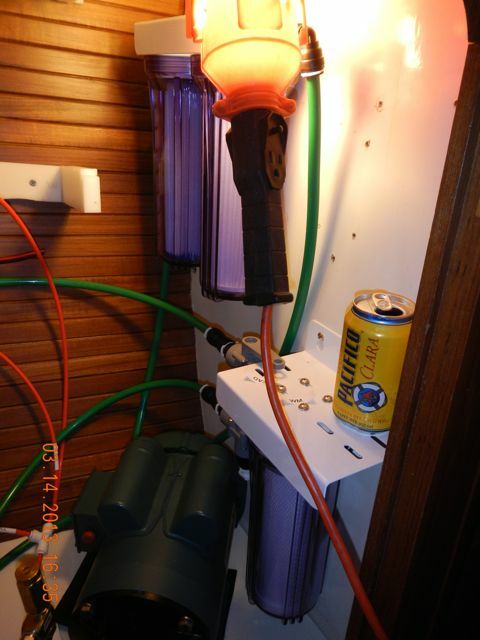 No, the Pacifico is NOT why it's taken me so long to install this thing! The two filters (20 micron, 5 micron) at top treat sea water after it comes from the tiny strainer. The lower charcoal filter is used to remove any chlorine from tank water and is shunted into the system when we backflush the system after use. Obviously, it's a great beer caddy, too.